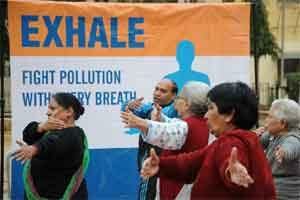 In a bid to tackle air pollution through a common cause, Indraprastha Apollo Hospitals has launched the Exhale initiative in the city. The initiative mainstay is to involve the citizens of Delhi in its fight against pollution and to take steps to ensure a safer and cleaner city of the future. Air pollution affects Auto rickshaw driver’s every day. 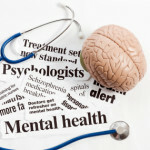 Their means of livelihood is also portends dangers to their health. Under the initiative, 10,000 safety masks have been distributed to auto rickshaw drivers in order to protect them from the ill effects of pollutants in the air. This step is to ensure that these vulnerable citizens are provided with basic means to tackle air pollution. Welcoming this initiative, Mr. Ved Prakash, an auto rickshaw driver in South Delhi said, “Everyday is a challenge for us. Earlier it was the extreme weather elements that we had to endure; now air pollution is affecting our health. We thank the hospital and the project for including us in their project. We will all as a fraternity raise awareness on air pollution and take steps to minimize it in whatever way possible”. 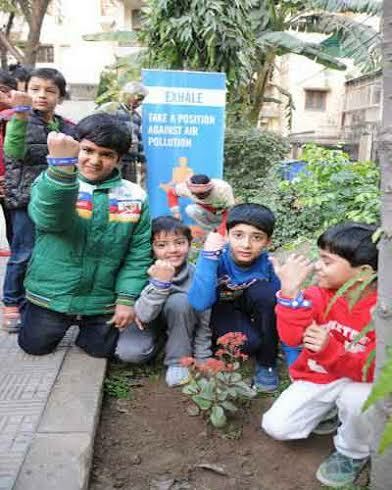 The project endeavors to ensure that the citizens of Delhi become more aware on the effects of air pollution, while at the same time take concrete steps to safeguard themselves. The initiative will run for two months. With the help of this campaign, Apollo hospitals has shown our commitment towards the community and society in educating, training and sensitizing the children and the citizens towards a healthy way of life. Be it awareness on air pollution, teaching yoga exercises or thinking about the welfare of daily commuters, we have incorporated all these and more in our quest to help the capital. Yoga used as therapy can also help in clearing the toxics in the body accrued during the cancer treatment. Yoga positions also have the ability to stimulate muscles, increases blood flow, enhancing the lymphatic flow in body and enhancing body’s internal purification processes. Deep breathing, which is often emphasized in yoga, helps in increasing the current of oxygen-rich blood to the cells, delivering vital nutrients to tired cells and further clearing out toxins. 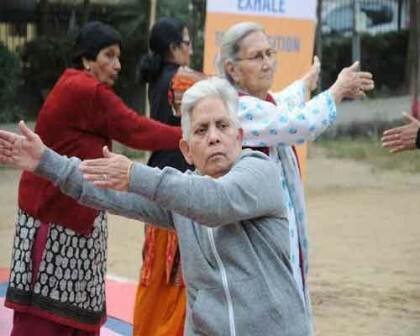 The yoga sessions saw participation from people aged between 10 and 70 years. The audience was keen on learning the asanas and practicing yoga with their instructors as they thoroughly enjoyed each session, which was followed by healthy snacks and refreshments. Passenger vehicles and heavy-duty trucks are the main sources of air pollution on our roads, which includes ozone, particulate matter, and other smog-forming emissions. 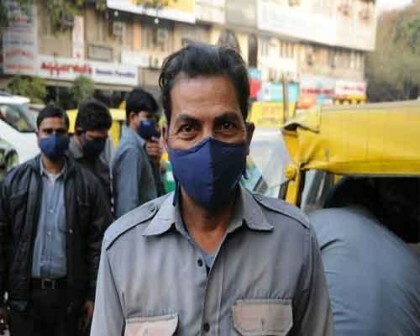 The health risks of air pollution for Auto drivers are extremely serious. Poor air quality increases respiratory ailments like asthma and bronchitis, heightens the risk of life-threatening conditions like cancer, and burdens our health care system with substantial medical costs. They operate in these circumstances without protection from the elements and are directly exposed to breathing in noxious and polluted air. Particulate matter is singlehandedly responsible for thousands of premature deaths each year. Thus our aim is to help these auto rickshaw drivers by providing them protection from the harmful air that they breathe in during the time they are on duty. They are the sole breadwinners for their families whose future and incomes depend on their ability to be out in the open and work in such a polluted environment. 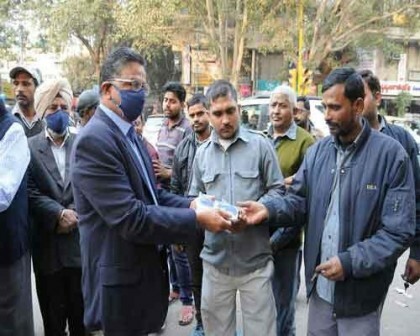 It is for this purpose that the management and staff members from Apollo presented 10,000 masks to the Chief Minsters office for the Delhi auto drivers. The essence of this campaign is to promote the concept of healthy living and ensuring that the air in our city remains clean and safe for all. 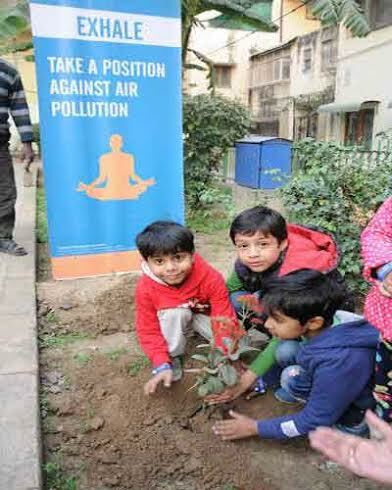 With the rising air pollution gripping the capital, this novel initiative shall act as a reminder for the children as well as the adults, the need for environmental preservation, especially the air we breathe in. The saplings were a reminder of the importance of Plants in our eco system and our dependence on them for sustaining a healthy and clean environment. The children were overjoyed when they planted saplings in their schools as it made them fell an integral part of a new green revolution that will transform their city. The administrators, teachers and staff members of all the schools joined in this effort and appreciated the thought. They felt that this initiative makes the children feel connected to the ongoing wave of environmental awareness and air pollution. It will help them to learn the importance of environmental preservation/protection and planting more trees to reduce the percentage of carbon dioxide, the main cause of global warming and deforestation.